I've been told before I'm a little crazy but this time it may be true as I'm seriously consider to buy the 30 mm f/1.4 EX DC HSM Sigma over the Pentax FA 50 f/1.4 for use in portrait shots. If it's not too late please STOP ME. Honestly I think it's a mistake, if you're getting it for portraits. Not only it's a bit short but it's not as good optically and it's more expensive. I'd stick with the 50, or the 40 Limited. It would be good for "environmental portraits," but not for head and shoulders. I think the old guideline was 1 & 1/2 times the diagonal of the format for head and shoulder shots. Not knowing the diagonal of the digital format, I can't suggest a specific focal length, but 30mm is definitely too short. However, having said that, I find most head and shoulders portraits boring, and prefer the person in their environment; it seems that the 40 or even the 50 would be a better all-around choice. Perhaps you could branch into group portraits? 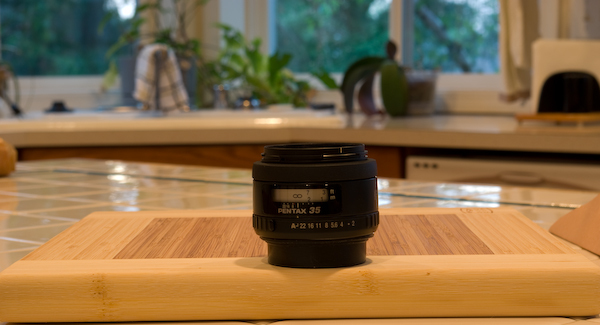 The diagonal measurement of the asp-c sensor is about 29mm, making a 30mm a normal lens for this format. This is why a 28mm is so handy to me. The 50mm makes a great lens for head and shoulders shots, while a 28,30 or 35mm would work well for full figure shots. Try it before you buy it. Stick one on your camera and take a shot of the salesman. Last edited by Big Dave; 05-07-2008 at 10:51 PM. 31 ltd is a pleasant focal length with APC camera. On a FF camera, my favorite focal length is 50mm. So 31 ltd shall be a multi-purpose lens for sure. It really has an edge to the image quality comparing to Fa 50 f1.4 photos. You get more consistent performance with 31 ltd. The 1.5x crop factor does not make a 30mm into a normal lens. While the FOV is similar to a 45mm, the perspective is much different. To see what I mean, set up a table-top test with three objects (all about ketchup bottle size); one at the edge, one about 6" behind that and to the side, and a the last another 6" back and to the side of that one and directly behind #1. With your handy kit lens set at 20mm and the camera pointed at the "waist" of the ketchup bottle, position the camera so the front bottle fills the frame vertically and all three bottles are at least partially visible. Do the same at 30mm, 45mm, and 55mm...each time adjusting the camera position so the front subject fills the frame. If possible, fill out the series with a shot at somewhere between 80mm and 135mm. The difference in relative height, and apparent distances of the three objects between the test shots should be VERY apparent. Imagine the same factors if the first object were the subject's nose and the second their ear! I am not saying that you can't take portraits with a 30mm, just that the time and place for doing so may be rather limited depending on subject and what you are attempting to portray. Last edited by stevebrot; 05-07-2008 at 05:38 PM. The 1.5x crop factor does not make a 30mm into a normal lens. While the FOV is similar to a 45mm, the perspective is much different.